Redesigning and Upgrading a website allow you to take advantage of updated technologies, new features, give your business a fresh look and feel, better and more reliable coding, and new ways to interact with your visitors. Changing the appearance (front end), HTML, CSS of the website is known as redesigning a website. How about getting the website optimized, upgraded with the latest technology to make it more internet friendly with the new technologies arousing day to day? Our website redesign services will help you with that so that your website looks fresh, better and more reliable. 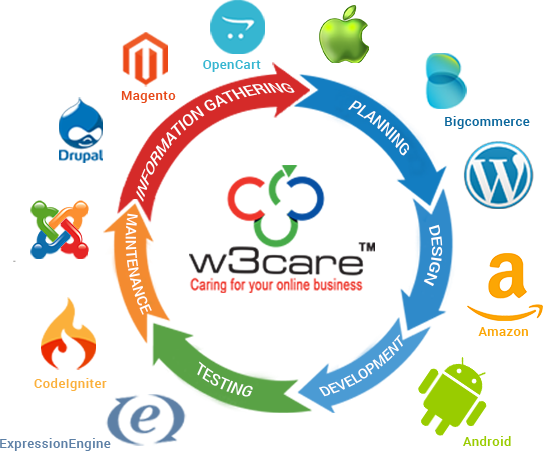 We at W3care are experienced with the concept of website redesigns and website revamps. If you have a thought in your mind of getting your website redesigned based on the appearance, functionality or layout, you are standing at the right door right now. We offer our client with different packages to get their website redesigned based on the features they look forward. We can even work with the existing design and add in new features, including content management systems, user forums, online shops, interactive photo galleries and much more. We also provide consultancy to our clients for their long benefits. If you have any ideas about getting your website redesigned you could tell us and we would deliver your idea over your website, or we can even provide you the consultancy for the recommended changes. We analyze the core functionality and purpose of your business; and our team gives their best to cut down the downtime. Our expertise redesigns your website with unique and marvelous UX & UI design which will surely trigger the visitors to convert into customers. We also take care of loading time of website for advancement of user experience. You will be delivered your redesigned website when you will be satisfied with our work. Website redesign services are most effectual to your site functionality so if you want your website to be redesigned then you are at right place. Contact us today with your requirements. W3care Technologies is a well reputed company for providing best website design and development. We also provide website redesigning to clients who are not happy with their old websites from other company or freelancer. We work with full dedication and design a unique website for your business. Our team also takes care of all aspects of W3C and SEO. We have dedicated team to provide support and maintenance for your site. It has been a pleasure to work with Satya and his team at W3Care Technologies. His knowledge of ExpressionEngine made all the difference on my projects and I am planning to hire him for many projects to come! A part of that, his communication channels are very valuable when you are working from far away - I feel very secure and confident seeing him online on Skype almost all the time... And I always look forward to receive his emails updates in the mornings! Thank you, Satya. Helena Artmann, Media Specialist and Social Media Strategist, Artmann Communications, Alberta, Canada. Our whole team of experts work towards the clients satisfaction and delight as our current success is all due to our high client contentment We follow an advanced methodology to accomplish the given clients proposal with highly innovative and optimized end to end app development. We work towards providing consummate solution in rapports of quality, time and functionality.